STAPLE Hill-based Joe Rawle has been studying karate since the age of eight. Now, 13 years later he found himself demonstrating some of his skills at a prestigious national karate meeting in Tokyo, Japan. Along with members from the adult karate group Zenshin dojo, Joe was invited to Japan to participate in a 50th anniversary celebration of a karate cub based at the Fujitsu headquarters in Tokyo. Zenshin dojo was the only UK-based group attending the event, which also included clubs from across Europe and Japan. 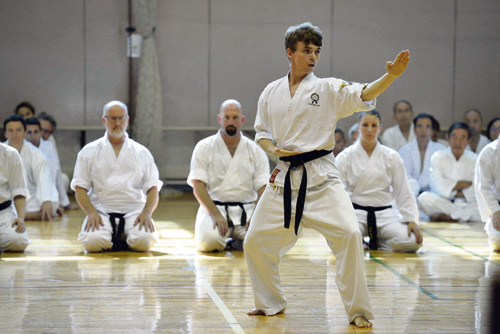 Joe, the youngest participant, was given the unusual honour of performing a solo kata (set pattern of moves) in front of 180 karate masters assembled from all over Japan. The two week visit wasn’t all hard work as Joe, who lives in Fishponds, and the rest of the group enjoyed visiting the Tokyo sights, Mount Fuji and a Zen Temple. “It was a once in a lifetime opportunity and experience and spurs me on to continue my karate studies,” said Joe.